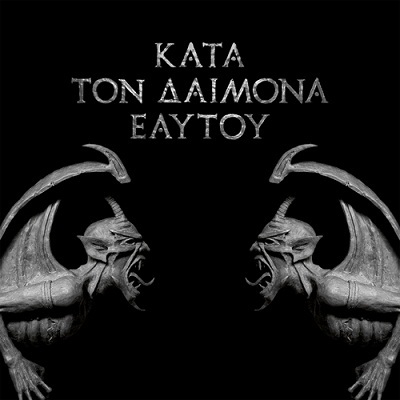 In nomine satana - in the name of Satan. Finally, Rotting Christ put together some fragments of Roman liturgy, especially from the Lord's prayer. Not all the latin forms, genders and endings are correct, but the devil will understand them all right. One last comment concerning the album's title. Some say that it's a phrase said by Aleister Crowley and means "Do what you will!" If Crowley said it, I don't know. 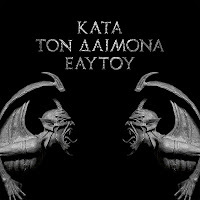 Anyhow, the title is written in Ancient Greek and means "in accordance with the inner demon itself". In Ancient times, men believed that every man had his personal "demon" or - better - "inner voice". The word "daimonion" haven't had a negative connotation then. It was also a little bit similar to our idea of the guardian angel. Maybe you know Socrates, the famous philosopher and persistent inquisitor of morale aspects. He was contemned to death because of corrupting the youth and of denying the Gods of the city of Athene. In court, he also refered to his daimonion and said that he just puts into practice what his inner voice says to him.